The automoboile club carried out a series of tests to determine which Summer Tyre delivers the safest grip on dry and wet roads but that also boasts good fuel economy too. The results demonstrated that many of the Premium tyre brands neglected the smaller 175 sizes due to car manufacturers not building new vehicles on 14” tyres. However, as the list of older car models below demonstrates, there is still a big demand for these tyre sizes. 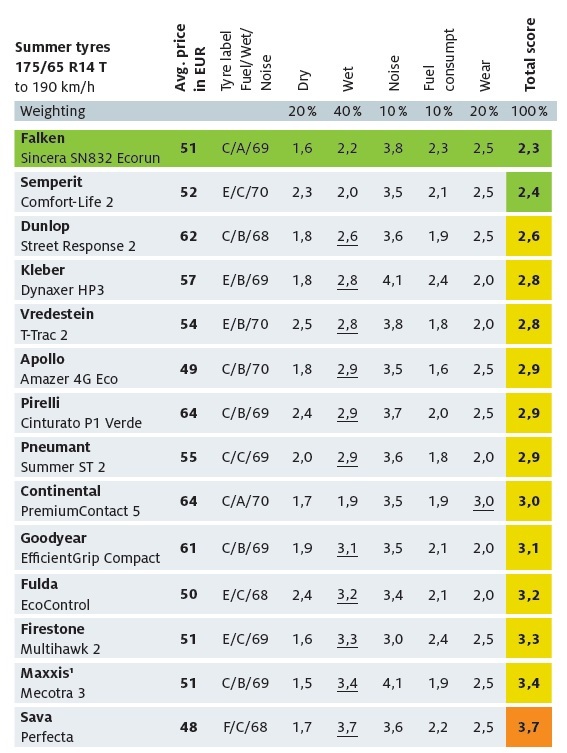 The results show that the Falken Sincera SN832 Ecorun is the best summer tyre for compact cars. Falken offer tyres that are affordable, reliable and most importantly, high-performance. It is just one of the reasons that Micheldever Tyres are proud to be the exlusive distributor of the brand in the UK. Falken’s focus on high technology and performance has seen further accolades achieved for the brand. The new AZENIS FK510 – was the winner of the ACE Summer Tyre Test and highly recommended by: Auto Bild, Auto Zeitung, Auto Strassenverkehr, Auto Motor und Sport and Arbö. The Falken AZENSIS FK510 offers exceptional driving comfort, first-class performance on dry and wet roads and extremely high aquaplaning resistance all guarantee maximum driving pleasure and safety. Find your nearest Falken dealer at www.falkentyresnetwork.co.uk. To find out more about becoming a Falken dealer contact us here.